Full fat, low fat, skim, lactose-free, soy, rice, almond, oat -- with such an array of dairy and non-dairy milk products available, shopping for the right milk can be a confusing and difficult task. Whether you like your plain dairy milk (but are unsure if low fat or full fat is best) or you want to try non-dairy milk (but don’t know where to start), this guide is for you. “Dairy is an important food group that provides us with protein, calcium, vitamin and minerals,” accredited practising dietician Sanchia Parker told The Huffington Post Australia. In particular, dairy milk contains vitamin A and B12, riboflavin, phosphorus, potassium, magnesium and zinc. If making good coffee is high on your priority list, full cream milk is most baristas' milk of choice for its ability to produce and hold silky frothiness. “Low fat is better in terms of reducing how much saturated fat you’re having, so that’s really important when it comes to keeping cholesterol levels low and improving our heart health,” Parker said. Low fat milk is also a good option for those watching their weight. “You’re also shaving off a few extra kilojoules out of your diet so, for someone who is looking to lose weight, the low fat milk is a better option,” Parker said. Many people may not enjoy the watery taste of skim milk, but it does have nutritional advantages. “Nutritionally, the added solids or powder provides extra protein and calcium,” Parker said. Skim and low fat milk do have a higher sugar content, but Parker says this is natural occurring sugar in dairy. As the calcium is added in the form of calcium carbonate powder, Parker has one tip to ensure you're getting the most from the calcium. 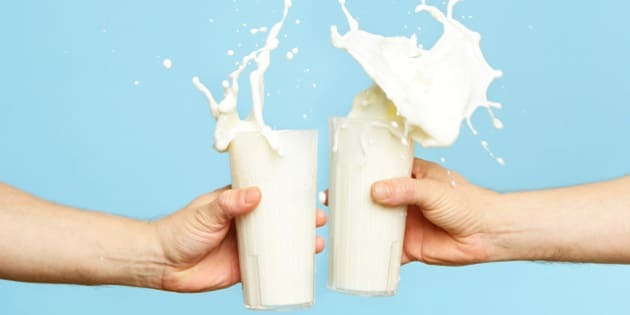 “With the dairy-free milks the added calcium sinks to the bottom of the milk, so before you have it, shake the bottle up to make sure you’re getting the calcium in there,” Parker said. Parker also advises to be wary of the sugar content. “Be careful of dairy-free milks that have added sweeteners -- plenty of brands include sugar, honey and other sweeteners to improve the taste of the products. If this is a concern, opt for unsweetened varieties,” Parker said. Rice and oat milk are naturally sweet and are more palatable non-dairy milk options, but are not the best options in terms of nutrition, according to Parker. Parker recommends looking for one with a high calcium content and, if you are concerned about sugar, opt for the unsweetened ones. Almond milk is one of the most popular dairy-free milks. According to Parker, however, while it is high in vitamin E and low in fat, it's lower in protein than milk and, again, can be high in sugar. Those who are environmentally conscious may also like to choose a different non-dairy milk. As Sarah Wilson discussed, it takes five litres to grow one almond and come with a large carbon footprint as almonds are usually imported to Australia. The process of making almond milk also produces a lot of food waste, as the leftover pulp extracted from the almonds is often tossed away. Although delicious, flavoured milk is not the recommended milk choice -- however, it’s better than some sugary drink options. “Obviously I wouldn’t recommend going out and having chocolate milk, but if you are going to have a sweet drink, flavoured milk is probably going to be better than soft drink because at least it’s got some protein and vitamin A and B12,” Parker said. For non-dairy milks, Parker's choice is soy milk due to it higher protein content. “Try Vitasoy Calci-Plus which has 160mg calcium and 3.2 grams of protein per 100ml,” Parker said.